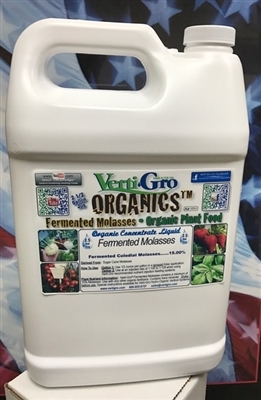 Verti-Gro Liquid Organic Fertilizer Supplement Concentrate, Fermented Molasses with trace Minerals, Diluted concentrate ships 1/2 full. NEEDS TO HAVE water added to complete the concentrate solution by customer. (((This reduces shipping costs for customer when we have the customer add 1/2 gallon of water, versus adding it pre shipment to complete dilute))). When customer completes dilution instructions... the concentrate is used at 1 ounce per gallon of water in nutrient delivery tank. See included instructions for specific use. Fcombo-6x4lbCase Hydroponic Formula 6x4lb Nutrient Combo Set FCombo: 2lb Bags (Qty 2) 6-12-28 & (Qty 2)15-0-0 Hydroponic Plant Nutrient Complete Combo Set 2lb Bag of 6-12-28 Verti-Gro Hydroponic Plant Nutrient with trace minerals. F61228 Half Gallon JUG of 6-12-28 (1 lb) Verti-Gro Hydroponic Plant Nutrient with trace minerals.